“As Liberia moves toward its tenth year of sustained peace, we can state with conviction that our country has turned the corner. We are no longer the country our citizens fled, our international partners pitied and our neighbors feared. 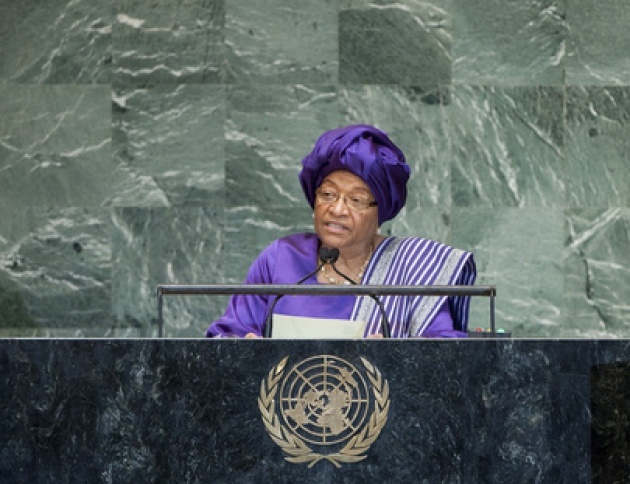 Liberia is no longer a place of conflict, war and deprivation,” asserts Liberia’s President Johnson-Sirleaf, (UN Photo Bottom from Adressing UNGA), speaking before the UN General Assembly. Liberia is perhaps on the verge of translating real economic growth into claiming the role of leader in the regional and the international economy. 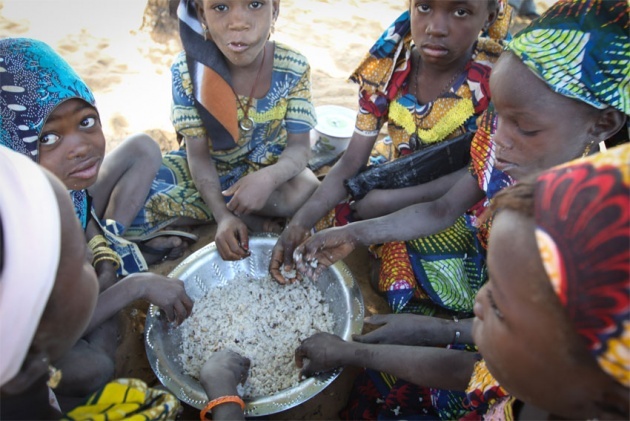 (Below UN Photo young girls at feeding center in Niger). Liberia is UN Success Story & for Africa? According to Liberia’s President, the UN has been a “a very committed and effective partner” as it emerged from conflict and embarked on the path to peace, security and development. “We owe the Organization much gratitude for preserving an enabling environment for peacebuilding and state-building.” (The UN has maintained a peacekeeping force in Liberia since 2003 to bolster a ceasefire agreement ending a decade of war that killed nearly 150,000 people, mostly civilians. 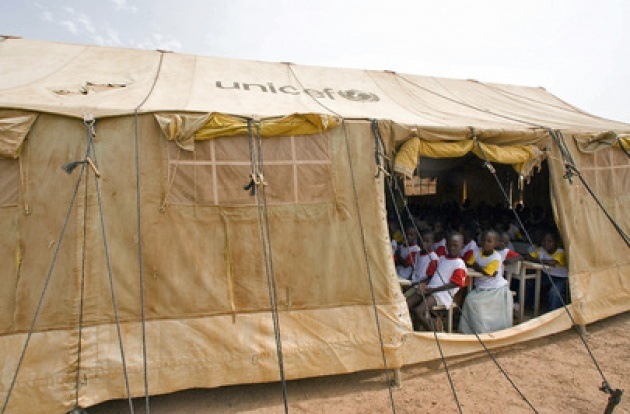 The mandate of the UN Mission in Liberia (UNMIL) includes helping to restore the rule of law and democratic processes, as well as facilitating humanitarian assistance). President Johnson-Sirleaf highlighted some of the gains made in recent years which have resulted in an average annual growth of over six per cent; the mobilization of over $16 billion in direct foreign investment; an expanded fiscal space through unprecedented debt cancellation, infrastructure reconstruction and institutional rebuilding. “More importantly, we have earned our rightful place as a country of hope and opportunity. 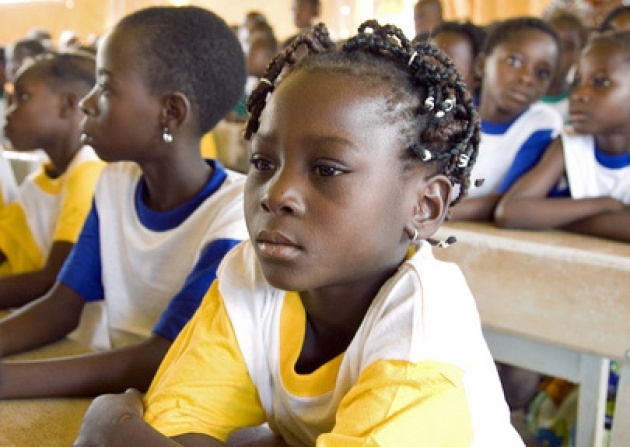 The processes of change which have started will continue and will not stop until the country is placed on an irreversible path of sustained peace, growth and development.” Education and economic growth are intertwined in Liberia’s plans. The country’s Vision 2030, resulting from a robust nationwide consultation, is a long-term program for transformation, which prioritizes youth development, infrastructure, reconciliation and capacity development. All of these are indicators of economic growth as well as providing social cohesion. If even partially successful in reaching its objectives, Liberia will be transformed into a driver of economic growth in Africa as well as the region. A decade earlier, under then ruler Charles Taylor, Liberia was a source of instability and opportunism in the region in everything from conflict diamonds to supporting ruthless insurgencies in the region. Now, perhaps Liberia can help lead West Africa out of the current calamities and model the way to political stability. new opportunity and further economic growth by country and region as whole.